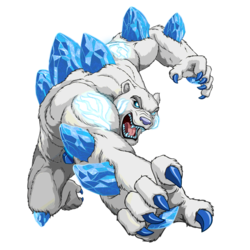 It’s a lot like Pokémon, but instead of pokeballs, there are blue cylinders and I remember this one creature that was a giant white bear with blue crystals on its back. I think the main guy is trying to find his father? I have found the anime I was looking for. It’s called Monsuno. The show revolves around "re-awakened Monster DNA called Monsuno" that finds its way into the unsuspecting hands of adventure-seeking teenagers Chase, Jinja, and Bren. Accompanied by their Monsuno, Liger, Charger, and Quickforce, they are searching for Chase's father Jeredy Suno, the creator of the Monsuno. They are soon joined by Beyal, a monk from the Himalayas along with his Monsuno Glowblade. 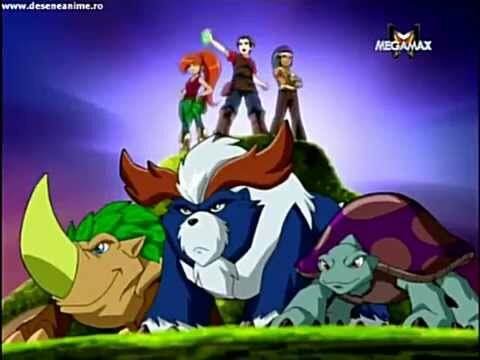 Beyal often speaks of five people that with the help of their Monsuno, could change the world. It just so happens that they are that five, along with Dax, a teenager who along with his Monsuno Airswitch, opposes the team and is disliked among most people. The team has yet to befriend him and persuade him to join their cause. They are also on the run from a H.A.M.M.E.R.-type agency called "S.T.O.R.M." (Strategic Tactical Operatives for Recovery of Monsuno) whose plans are still in question and Dr. Emanuel Klipse, a malevolent scientist who has his own nefarious plans. The white bear monster is Lock. Thank you for the help everyone. The evil Shadow Magi, Agram, was sealed in the Core through the power of the Core Glyph and the eleven Dreamstones. Three thousand years later, his power has grown and threatens to destroy the Moonlands. To combat Agram, a human boy, Tony Jones, was summoned to fulfill a prophecy of the Final Dreamer and to join Edyn and Strag on a mission to follow the Book of Elders and collect the Dreamstones. What does not match is that Tony is not looking for his father, although there is an episode where one of the companions is looking to save her father. Iyori brings word from Paradwyn that Ashio is poisoning the Moonland's soil and that her father and leader of Paradwyn, Bazha, has been captured. With the help of Saranther, the trio are able to rescue Bazha and restore Paradwyn. I found this via a search for anime pet monster blue crystals. Book identification: Book about an adolescent boy interested in WW2 memorabilia, wakes up in different time period. 1990s anime with Spaceship shaped like a white dragon and has guardian manned robots? cartoon where they used sand timer looking things to summon monsters?